This patent-pending design is based on the PatchMAX 100A, but it comes with two computer controlled manipulators. 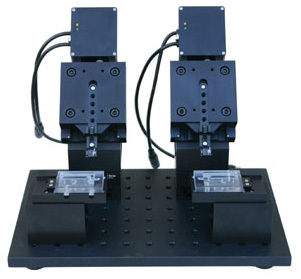 With the additional micromanipulator, the system can do two patch clamp experiments simultaneously, or one two-electrode voltage clamp experiment. With this new design, the system increases efficiency, decreases equipment cost, and saves space. As the system is controlled by the computer, the experiment becomes less labor intensive. 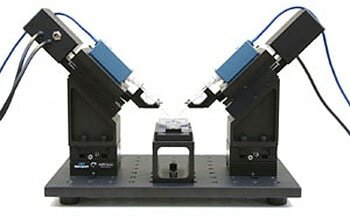 The ChannelMAX 100A Mini comes with two computer controlled manipulators, as a result users can run two patch clamp experiments simultaneously. Doing two experiments at the same time allows for better decision making while doing experiments. Single channel activities are random events. It is difficult to understand what is going on by looking at the channel open and close, especially when you are working on a new channel. For example, it is hard to distinguish a channel with two open stages from two channels in the same patch. With two patches that are treated with the same conditions you have more information that could be critical in making the right decisions while working on the precious seals. 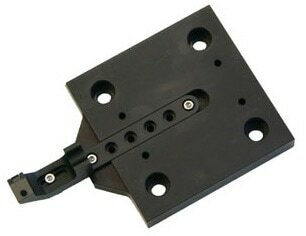 As in the PatchMAX 100A, the ChannelMAX 100A the patch clamp is noise free and low drift. The computer controlled system eliminates human errors so the success rate of making gigaohm seals using the ChannelMAX 100A is over 90%. It is very easy to change the configuration to run two independent experiments. As shown in the figure on the right, you can easily have two perfusion chambers on the same setup. For the two-electrode voltage, impalement is controlled by computer so no microscope is needed. When the electrode enters the oocyte, the membrane potential changes and the movement is stopped. The user can define the membrane potential threshold and delay for the stop after the electrode enters the oocyte. This system is more cost effective than a traditional electrophysiology setup. In order to reach the same functionality and productivity using a traditional setup, the equipment cost would be much higher, as compared in the table below. Plus labor cost is additional. Coming with the lower cost is also better quality. As the system can be used for both two-electrode voltage clamp and patch clamp, less lab space is required. You do not need two data acquisition systems. All the data is on one computer, so it is easy for you to compare. The system is designed so that it can switch from patch clamp to a two-electrode voltage clamp easily. With all of the adjustable parts, the system can easily be adapted to different glass electrode lengths and sizes, and different amplifiers. It is possible to use the ChannelMAX 100A Mini with a traditional two electrode voltage clamp to run two two-electrode voltage clamp experiments simultaneously. As the system is automated, it is easy to run experiments in parallel to increase efficiency. Patch clamp and two-electrode voltage clamp should not be as labor-intensive as before. Let the equipment do the hard work for you!